The leaders of the American Library Association recognized the significance of its fiftieth anniversary in 1926 and celebrated accordingly. 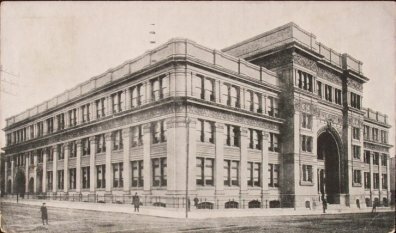 The primary site for ALA's annual conference, October 4-9, 1926 was Atlantic City, New Jersey, but arrangements were also made to have commemorative sessions in Philadelphia on October 6, the date that ALA was founded in 1876. The attendance in Atlantic City was 2,224, the largest ever for an ALA conference. Of that number 1,200 traveled to Philadelphia for the commemorative sessions which took place at Drexel Institute (see postcard above). They were treated to presentations by Richard R. Bowker and Melvil Dewey, two of the founders of ALA. America was also celebrating the sesquicentennial of the American Revolution with an International Exposition in Philadelphia in 1926 . As it had at some previous world expositions, ALA sponsored an exhibit which was located in the Palace of Education and Social Economy at the exposition. Included in the exhibit was an eighty-foot map of the Cleveland Public Library system which was intended to demonstrate how a large public library served the public. Also in the exhibit was a printing press which printed out book lists and brochures which were distributed to exposition attendees. A model library included 2,000 adult books, 500 juvenile books, and 100 reference books. The ALA conference sessions in Atlantic City had an international theme with presentations by foreign librarians. It was at this conference that the concept of an international organization of library associations was brought forth resulting in what is now the International Federation of Library Associations and Institutions (IFLA). Also at this conference ALA elected George H. Locke of the Public Library as its new president, the first and only time a Canadian has been elected president of ALA. The source for much of the information in this post is A History of the American Library Association 1876-1972 by Dennis Thomison (ALA, 1978).